Have you ever wanted to experience a jungle expedition? One were you can see wildlife up close and personal in their natural habitat; sleep in a cabin in the jungle; walk miles of pristine untouched beach; and watch as leather back sea turtles lay their eggs in the sand right before your eyes? Look no further than Tortuguero National Park in Costa Rica! 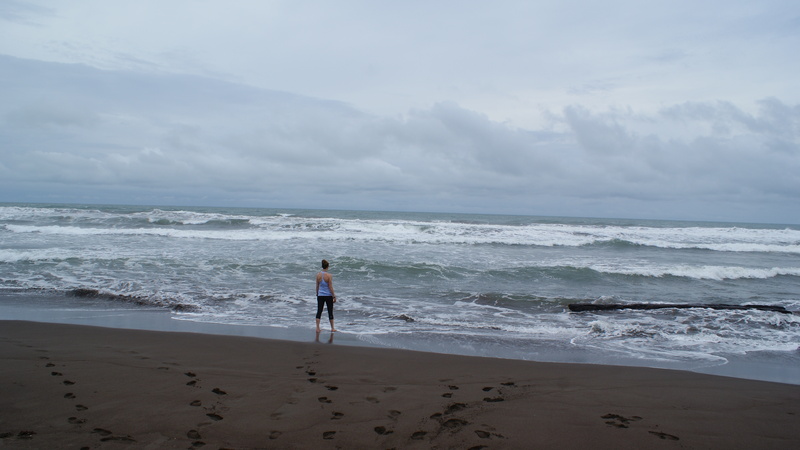 While traveling in this Central American country, my boyfriend K and I visited Tortuguero, both named for the village and the National Park located along the Caribbean coast in north eastern Costa Rica. This is a wonderful, semi-secluded park where you can see wildlife in their natural environment. Boat ride into the park. Some consider this region to be the ‘Amazon of Central America’. The park covers 76, 937 hectares, 2/3 of which covers the marine environment, 1/3 being land. TNP is one of Coast’a Rica’s main attractions and has gained worldwide attention for its protection of the largest nesting beach in the western hemisphere for the green turtle. The park can only be reached by air or water as there are no roads. We chose to travel 1 hour by motor boat through jungle canals and mangrove forest. This was definitely one of the times where the journey in was just as incredible as the destination itself. Navigating the jungle canals en route to Tortuguero. The whole area is largely made up of rainforest, mangrove jungle and canals. The village of Tortuguero is located on a sliver of land with mangrove jungle to the west and the Caribbean Ocean to the east. There are miles of beautiful sandy beach and this area is one of best places in the world to view a variety of sea turtles as they lay their eggs. The main source of income for locals here is eco-tourism. Most accommodations are situated right in the jungle, close to the village. You won’t have to look far to spot wild flora and fauna. I was greeted by a troop of Capuchin monkey’s upon our arrival at my hotel. My boyfriend and I stayed at Rana Roja Lodge & Cabina in a cabin raised above the swampy jungle floor. A series of boardwalks connect the cabins and we really felt like we were sharing the jungle with its local inhabitants. At night we could hear the roar of the howler monkeys resonate through the jungle, with a symphony of jungle voices in the background. During our short stay in Tortuguero, we did an early morning canoe tour to search for wildlife in the mangrove jungle. At night we went for guided walk along the beach in search of sea turtles. As outdoor enthusiasts and nature lovers, we were in paradise! There are main options for wildlife viewing: via motor boat or canoe. After some research we decided to try the canoe, for 2 reasons. One, motor boats are disruptive to the wildlife you are trying to view so you might end up scaring them away. Two, motor boats cannot access the smaller, narrower channels that row boats can. K and I had a very early morning with our tour beginning at 5 am. The sun was just rising, the animals awakening and the water was like glass, covered with a thick layer of fog. Once our small group had settled in the boat our guide began a slow but steady row away from the village towards the jungle on the opposite banks. Everything was still and peaceful, save for the motor boat tours that were also departing. Early morning mist in TNP. 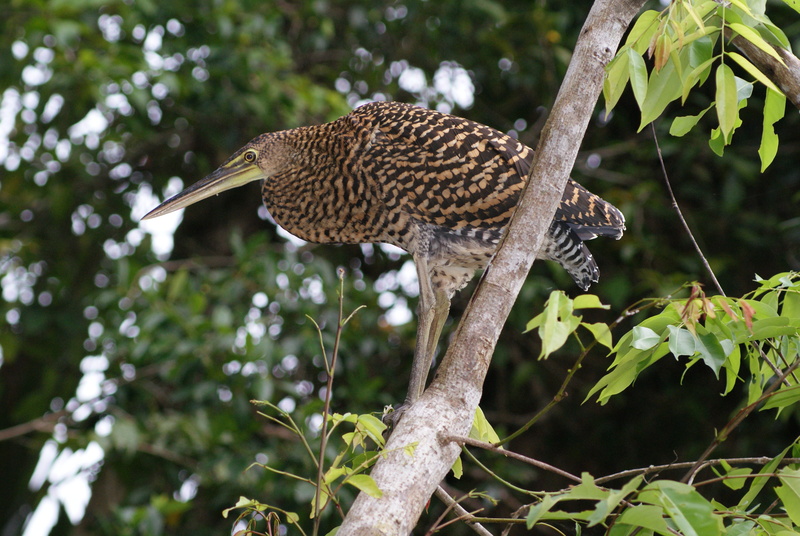 Our first animal sighting was a big, beautiful tiger heron who was standing on a branch of a tree overhanging the water. He didn’t seem to mind our company and stood still, posing for the cameras. We continued on, slowly making our way from the main channel into smaller canals, looking for solitude from the many other early morning tours. Our guide was amazing, often pointing out animals that were completely invisible to the rest of us until we were almost on top of them. The caimans were especially good at hiding just below the surface of the water, with only the tops of their heads and their dark black eyes penetrating the surface. At one point our guide alerted us to 3 baby caiman resting in such a manner among a collection of lily pads. How our eagle-eyed guide spotted them is beyond me because it took a full 2-3 min of searching, directly where he pointed, until I could distinguish the baby caimans from their surroundings! Throughout our 4 hour excursion we saw so much! Our list includes many caiman, an iguana basking in the early morning sun, howler monkeys jumping from tree to tree. a toucan sitting high in the jungle canopy, a beautiful black water bird standing on a log with his wings fully extended while he tried to dry himself after a fishing underwater, and a cute little Jesus Christ Lizard. The list goes on and I was surprised to find that I was only able to point out one or two of the animals without the assistance of our eagle eyed guide. While in Tortuguero (which means “Land of Turtles”) we had to go turtle watching along the beach. TNP is one of the best places to view nesting sea turtles. The park is very important ecologically as it provides one of the main beaches for the endangered Green turtle to lay their eggs. 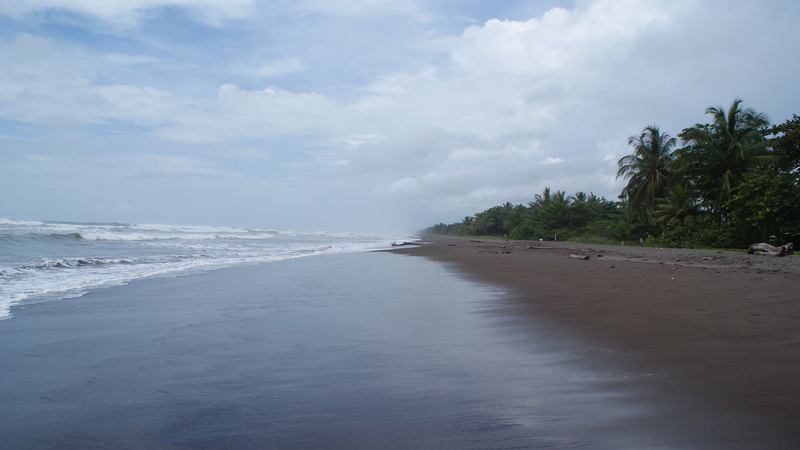 Leatherbacks, Hawksbill and loggerhead turtles also nest along Tortuguero’s beaches. We started our beach walk at 10 pm with the moon and the stars. Our group walked along the beach for what felt like miles, always on the lookout for turtles. Our guide was considered to be an expert in locating these beautiful reptiles but unfortunately luck was not on our side that night. Though we didn’t see any turtles, the experience itself was amazing. That night there was a large thunder and lightning storm away out on the Caribbean ocean. While we were safe from the wrath of this ocean monster, it was quite the experience to watch this storm in all its glory as it lit up the sky in the distance. If you’re ever in Costa Rica I highly recommend visiting this wonderful park! It gives you a first hand experience right in the heart of a Costa Rican jungle like no other. Filled with wildlife, spectacular scenery, beaches and lots of adventure, it’s a place not to be missed. I will definitely have to return there again one day to search for its name sake, turtles! Planning a visit here this summer – great post! Thanks! It was a wonderful park to visit, so much wildlife. Enjoy your trip!